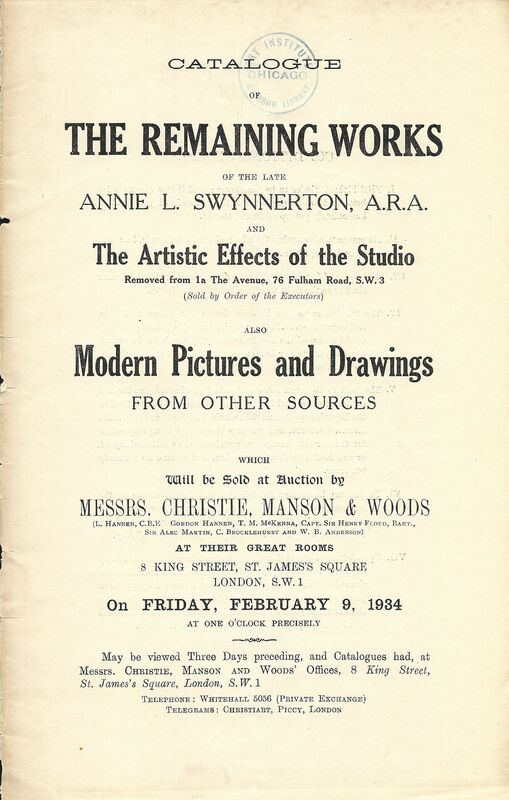 THE POSTHUMOUS STUDIO SALE OF 1934. 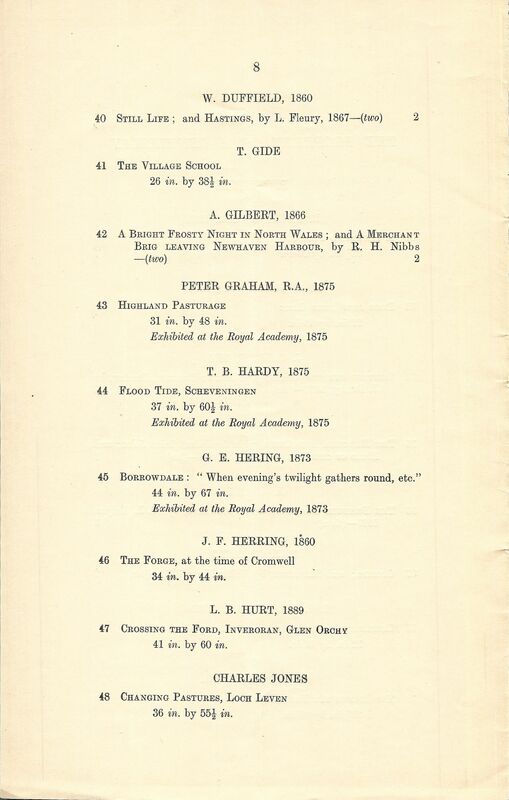 A scanned copy of the catalogue is available here: archive.org, as a pdf here: PDF, and individual page images below. Lots 1 to 55 were from the ‘other sources’, unconnected with the studio clearance, but by coincidence also included one work by Annie (lot 18). 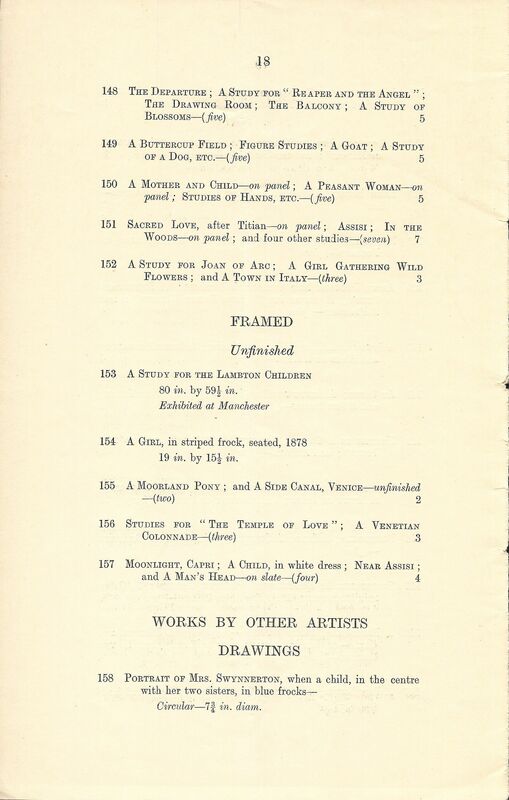 Lots 56-157 were all from her studio, and included 275 paintings, mostly unfinished, two drawings and a small statuette which the text says was ‘by Annie’. The remaining lots were paintings by other artists found in the studio, as well as Annie’s jars, easels, frames and her palette. The majority of the works are lost, but a significant number, such as Cupid and Psyche and the portrait of Dame Millicent Garrett Fawcett have survived and are in public collections or recognised in auction catalogues. 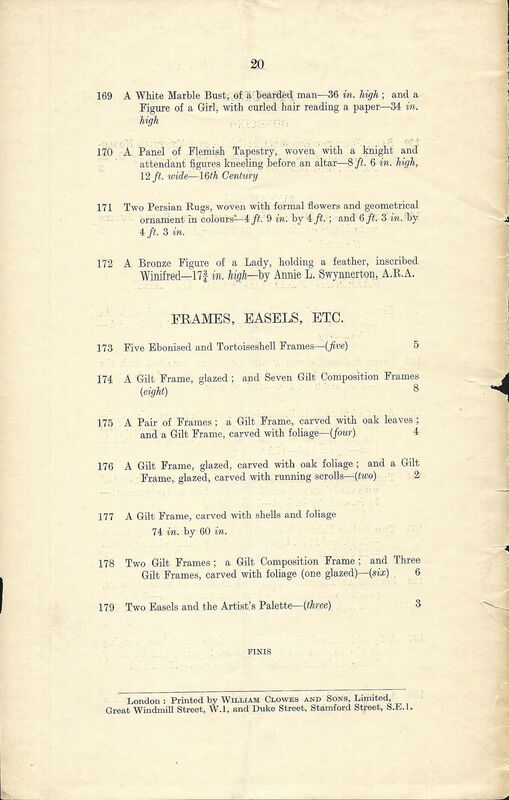 The list below is taken directly from the catalogue, with metric equivalents given for painting dimensions added. Many paintings were sold in batches, as many as 14 in a single lot, but each has been given a separate line here. Paintings which appear to have specific names are given in bold, while names which are simply descriptive are given in plain text, although this is sometimes guesswork. Lot 18. A child in a white frock. 16½ x 13¼ inches (41.9 x 33.7 cm), by Annie L. Swynnerton, A. R. A. 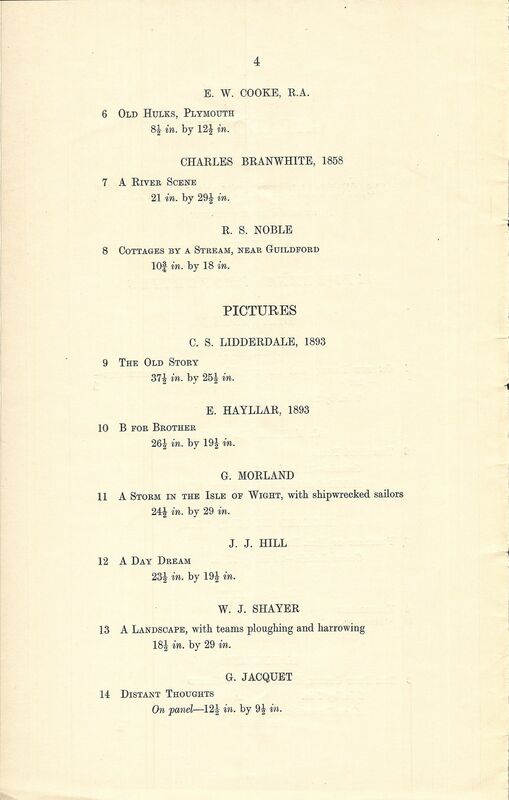 The other artists in the general sale were: R. Ansdell, D. A. C. Artz, Charles Branwhite, F. C. B. Cadell, J. Callow, Eug. 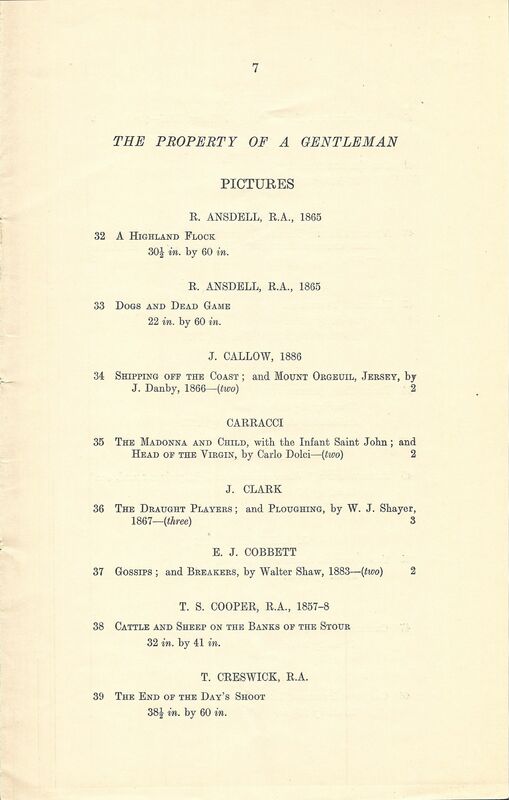 Campotosto, ‘Carracci’, J. Clark, E. J. Cobbett, E. W. Cooke, T. S. Cooper, T. Creswick, A de Breanski, W. Duffield, T. Gide, A. Gilbert, Peter Graham, T. B. Hardy, E. Hayllar, C. G. Hellgrist, C. Napier Hemy, G. E. Herring, J. F. Herring, J. J. Hill, L. B. Hurt, G. Jacquet, Charles Jones, E. Ladell, G. Lance, F. R. Lee, C. S. Lidderdale, James T. Linnell, J. T. Lucas, A. Montague, G. Morland, Sir David Murrat, P. Nasmyth, R. S. Noble, Julius Olsson, A. Peppercorn, ‘Potter’, A. Ribossi, Ch. 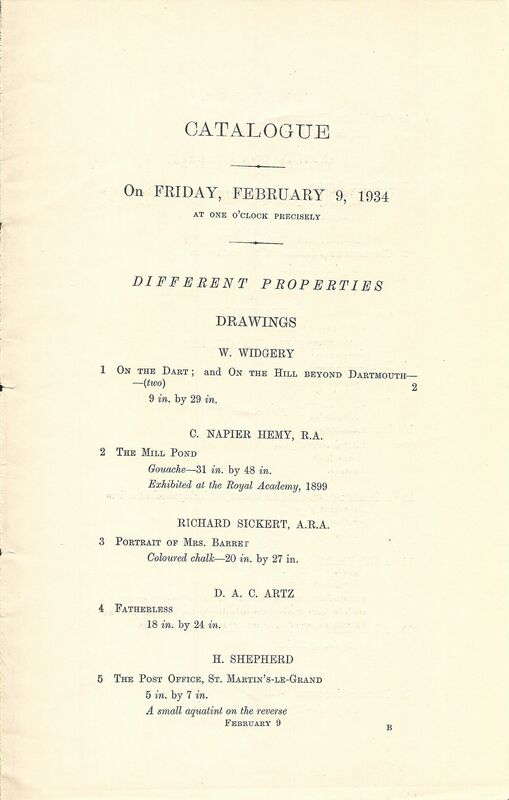 Sell, W. Shayer, W. J. Shayer, H. Shepherd, Richard Sickert (2 works), J. B. Smith, ‘Snyders’, H. Verboeckhoven, and W. Widgery. 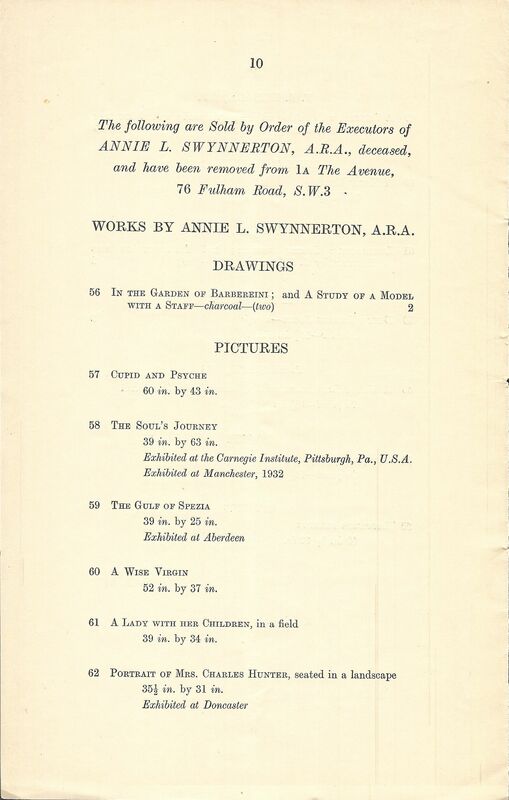 THE STUDIO SALE – WORKS AND EFFECTS OF ANNIE L. SWYNNERTON. In the Garden of Barbereini (charcoal). A study of a model with a staff (charcoal). Lot 57. Cupid and Psyche. 60 x 43 inches (152.4 x 109.2 cm). Lot 58. The Soul’s Journey. 39 x 63 inches (99.1 x 160 cm). Exhibited Carnegie Institute, Pittsburgh; Manchester, 1932. 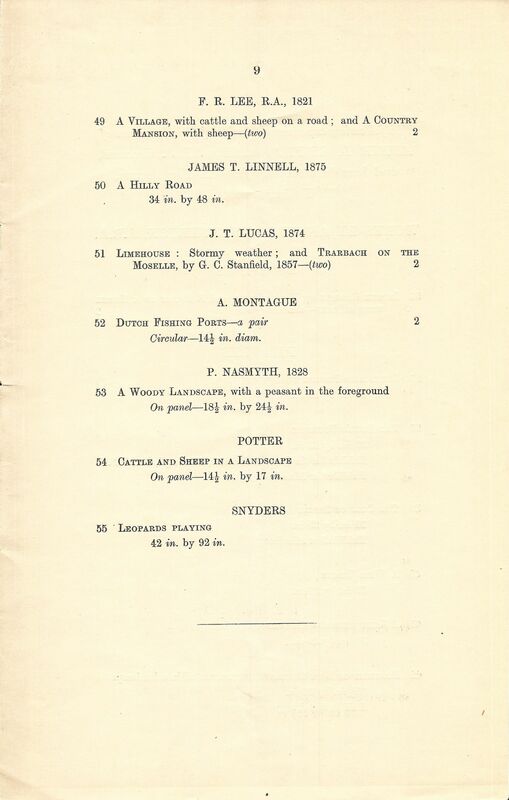 Lot 59. The Gulf of Spezia. 39 x 25 inches (99.1 x 63.5 cm). Exhibited Aberdeen. Lot 60. A Wise Virgin. 52 x 37 inches (132.1 x 94 cm). Lot 61. A lady with her children in a field. 39 x 34 inches (99.1 x 86.4 cm). Lot 62. Portrait of Mrs. Charles Hunter, seated in a landscape. 35½ x 31 inches (90.2 x 78.7 cm). Exhibited Doncaster. 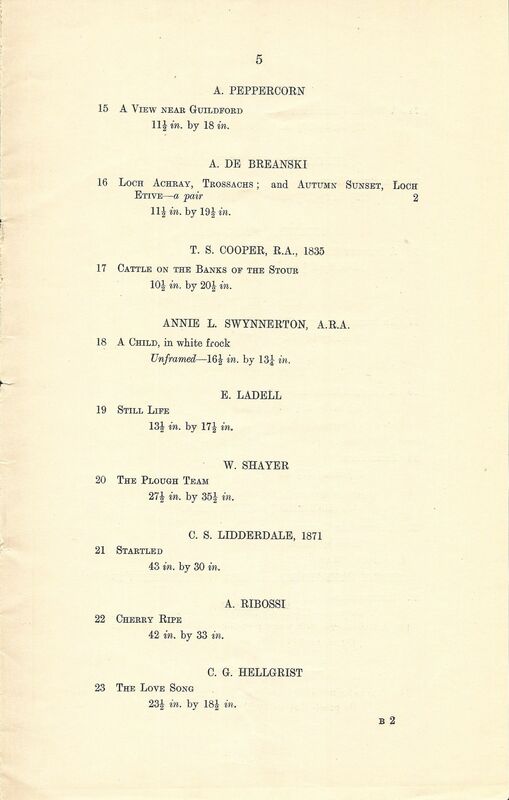 Lot 63. The Forsaken Wife. 51½ x 21¼ inches (130.8 x 54 cm). Lot 64. The Brothers: two boys with a parrot. 35½ x 27½ inches (90.2 x 69.9 cm). Lot 65. Master and Man. 1905. In a painted oval. 35¼ x 25½ inches (89.5 x 64.8 cm). Exhibited New Gallery, 1908. Lot 66. Where Sheltered Mountains Lie. 25 x 49 inches (63.5 x 124.5 cm). Exhibited Aberdeen, 1931; Manchester. Lot 67. The Letter. 39½ x 18½ inches (100.3 x 47 cm). Lot 68. Portrait of a gentleman. 29½ x inches (74.9 x 24.5 cm). Lot 69. The Lizard. 1874. 25½ x 29 inches (64.8 x 73.7 cm). 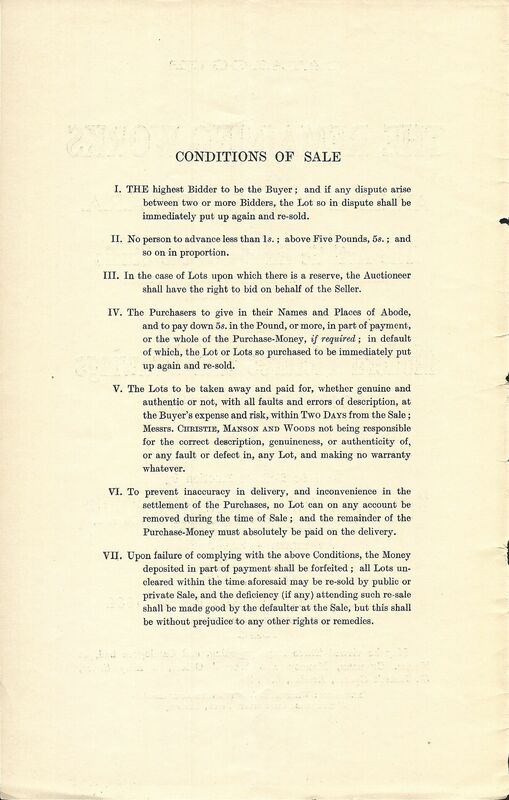 Lot 70. A Distant View of the Sabines. 22 x 19½ inches (55.9 x 49.5 cm). Exhibited Huddersfield. Lot 71. 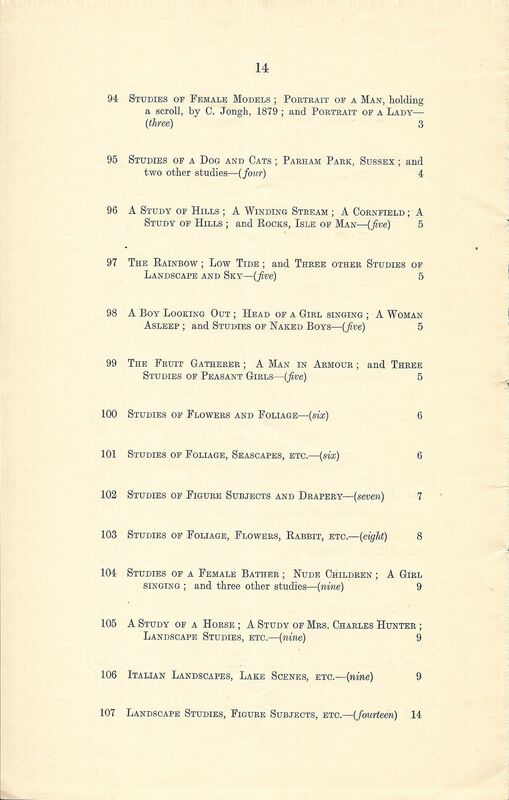 The Sisters: the daughters of Lord Ponsonby. 26 x 26 inches (66 x 66 cm). Lot 72. An extensive landscape with hills in the distance. 18½ x 24¾ inches (47 x 62.9 cm). Exhibited Manchester. Lot 73. Portrait of Henry James, Esq, in dark coat; red curtains background. 22 x 19½ inches (55.9 x 49.5 cm). 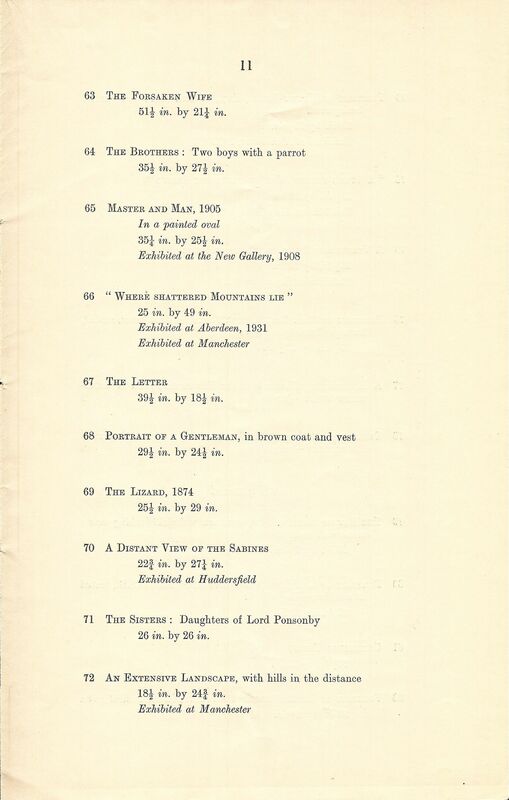 Exhibited Manchester, 1932. Lot 74. A Storm-Tossed Willow Feels the Spring. 19½ x 16 inches (49.5 x 40.6 cm). Exhibited Manchester, 1933. Lot 75. A view from Tuscany towards Rome. 13¼ x 19 inches (33.7 x 48.3 cm). Exhibited Doncaster. Lot 76. Portrait of Mrs. Christopher Tonks, in dark dress, seated, her right hand to her head. 15½ x 12¾ inches (39.4 x 32.4 cm). A Mountainous Landscape at Frascatti. Twilight: a Neapolitan woman. 1876. A boy in a nightdress. Lot 79. The Bay of Naples: a woman and child looking over a stone wall on to the Bay. 1883. 20 x 50 inches (50.8 x 127 cm). Lot 80. Portrait of Miss Louisa Garrett Anderson, C.B.E., seated at a table reading a book. 31 x 32 inches (78.7 x 81.3 cm). Lot 81. Gathering Tulips. 24½ x 30 inches (62.2 x 76.2 cm). Lot 82. Portrait of Dame Millicent Fawcett, in academical gown. 29 x 24 inches (73.7 x 61 cm). Lot 83. A view of the coast, Isle of Man. 19½ x 37 inches (49.5 x 94 cm). Lot 84. A Tuscany Girl. 23¼ x 17¾ inches (59.1 x 45.1 cm). Lot 85. Portrait of a lady wearing a bead necklace. 1909. 21½ x 17¼ inches (54.6 x 43.8 cm). Lot 86. Sisters. 20 x 15¾ inches (50.8 x 40 cm). A garden at Hill, Essex. Portrait of a lady in a white dress with red bows. A lady holding a letter. Lot 89. An Angel of Mercy. Arched top. 155 x 107 inches (393.7 x 271.8 cm). Lot 90. A Roman Mother. Arched top. 124 x 84 inches (315 x 213.4 cm). Lot 91. Mrs. Charles Hunter as “Queen Elizabeth.” 113 x 74 inches (287 x 188 cm). A study of a lady. A woman lying on the grass. 1887. Portrait of a man holding a scroll by C. Jongh. Studies of a dog and cats. One of three studies of landscape and sky. Head of a girl singing. A study of a rabbit. A study of a horse. A study of Mrs. Charles Hunter. 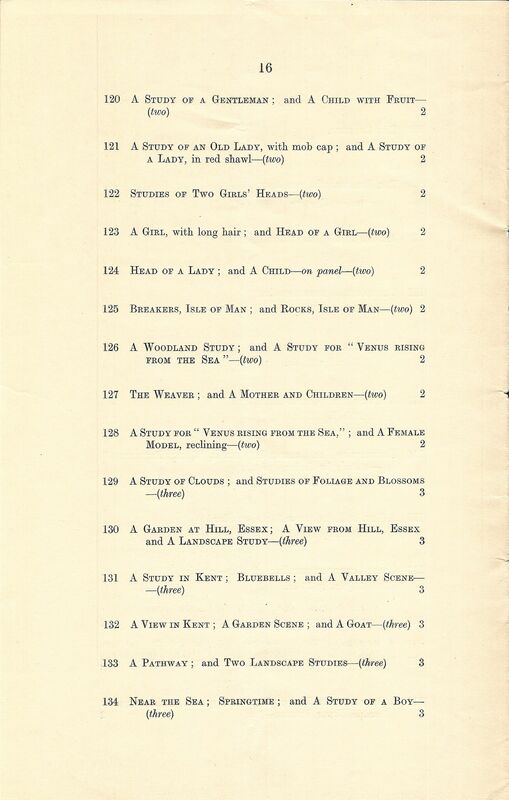 Lot 108. The Charmer. 120 x 85 inches (304.8 x 215.9 cm). 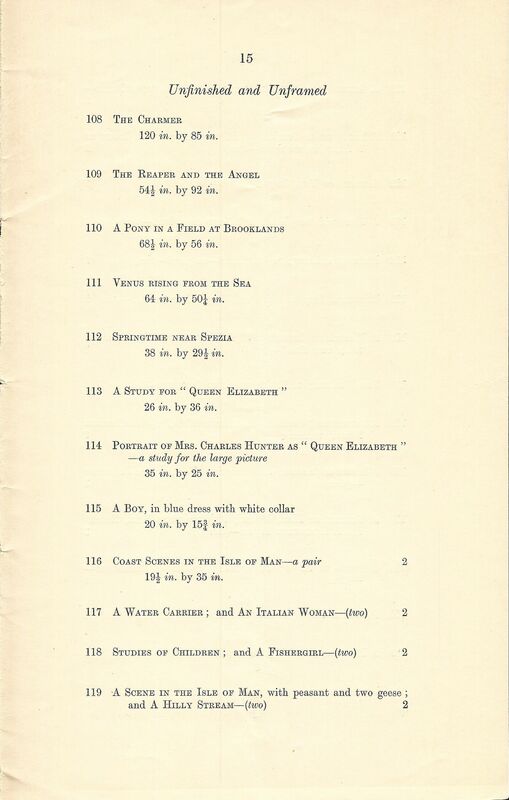 Lot 109. The Reaper and the Angel. 54½ x 92 inches (138.4 x 233.7 cm). Lot 110. A pony in a field at Brooklands. 68½ x 56 inches (174 x 142.2 cm). Lot 111. Venus Rising from the Sea. 64 x 50¼ inches (162.6 x 127.6 cm). Lot 112. Springtime near Spezia. 38 x 29½ inches (96.5 x 74.9 cm). Lot 113. A study for “Queen Elizabeth.” 26 x 36 inches (66 x 91.4 cm). Lot 114. Portrait of Mrs. Charles Hunter as “Queen Elizabeth” – a study for a larger picture. 30 x 25 inches (76.2 x 63.5 cm). Lot 115. A boy in a blue dress with a white collar. 20 x 15¾ inches (50.8 x 40 cm). Coast scene, Isle of Man – one of a pair. 19½ x 35 inches (49.5 x 88.9 cm). A scene in the Isle of Man with peasant and two geese. A study of a gentleman. A study of an old lady with a mob cap. A study of a lady in a red shawl. A girl with long hair. A view from Hill, Essex. A study of a boy. A study of a child. A girl with a lamb. A study of female figures. Apple blossom and children’s studies. A study at Hill, Essex. The Late Hon. Mrs. Baring, seated. A child at a fountain. A fisherman, Porto d’Anzio. On panel. A mother and child. On panel. A study of a head. A study of a dog. A peasant woman. On panel. Sacred Love, after Titian. On panel. In the Woods. On panel. A study for Joan of Arc. A girl gathering wild flowers. Lot 153. A study for the Lambton children. 80 x 59½ inches (203.2 x 151.1 cm). Exhibited Manchester. Lot 154. A girl in striped frock, seated. 1878. 19 x 15½ inches (48.3 x 39.4 cm). A child in a white dress. A man’s head. On slate. Other items from the studio. 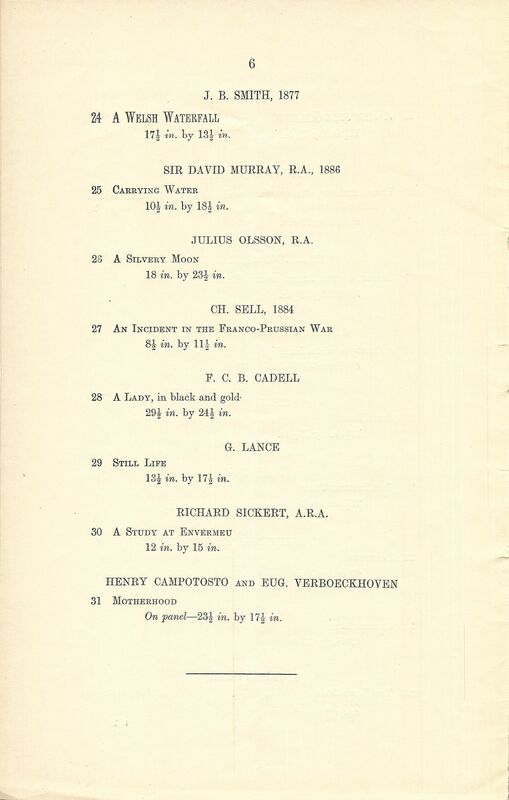 Lot 158. Portrait of Mrs. Swynnerton, when a child, in the centre with her two sisters, in blue frocks. Drawing, circular, 7¾” (19.7 cm) diameter. * In a Christie’s auction of 7 October 1999 two paintings, oil on canvas, unframed and unstretched, “Tobias and the Angel” and “Sybils praying before a brazier” by “a follower of Francesco Zuccarelli,” provenance “Anne L. Swynnerton A.R.A. Christie’s, London, 9th February 1934, lot 160” were sold as a pair for £1,035. 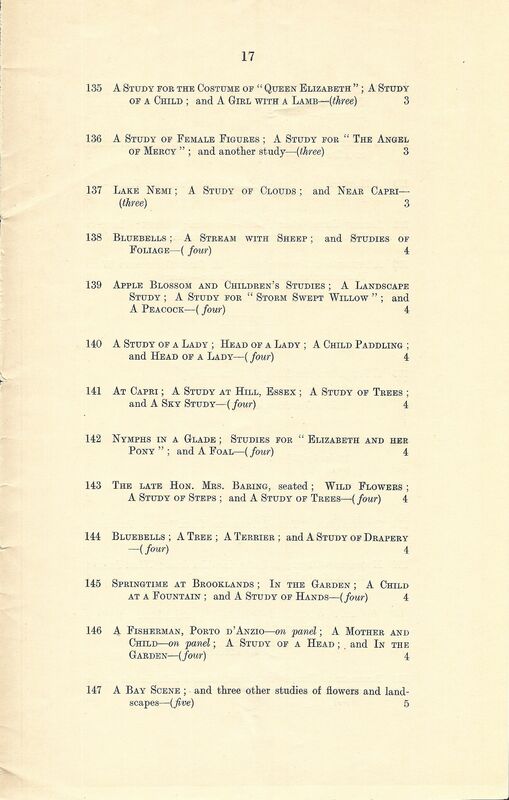 Lot 161-166. Fifty jars and water vessels, many faience and pharmacy containers. Lot 167.01. A Spanish carved wood group of Mary Magdalene, weeping at the base of the cross. 44″ (112 cm) high. A carved ivory group of Christ crucified, in metal case. 17″ (43 cm) high. 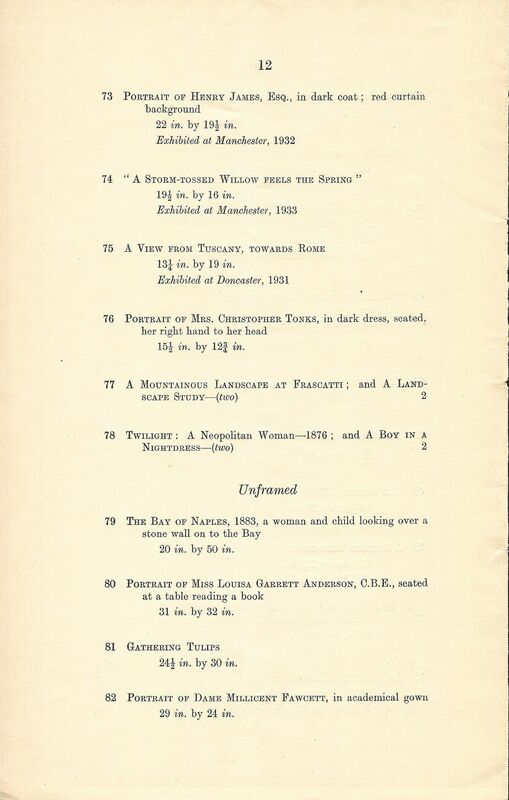 Lot 168. A white marble bust of a cardinal, wearing his chain of office. 30″ (76 cm) high. 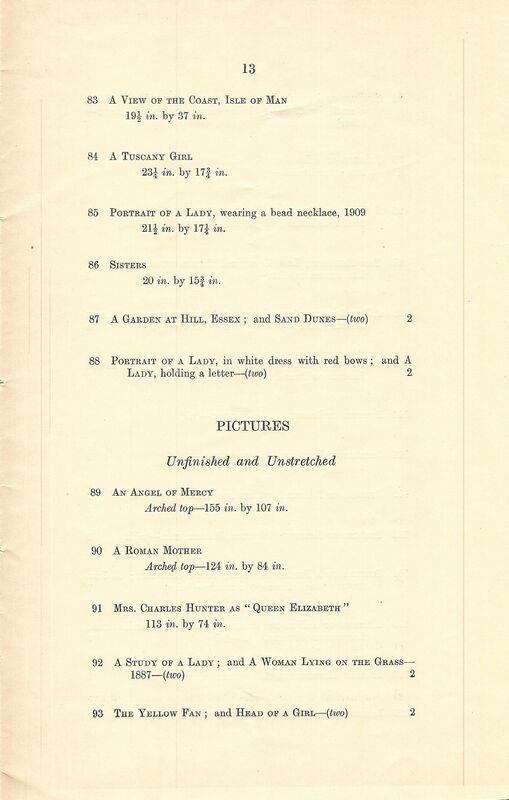 Lot 169. A white marble bust of a bearded man. 36″ (91 cm) high. A figure [i.e., sculpture] of a girl with curled hair, reading a paper. 34″ (86 cm) high. 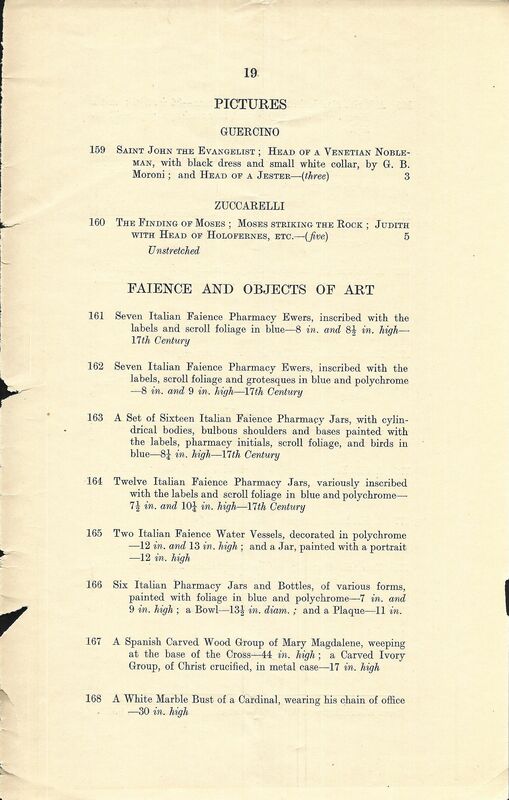 Lot 170. A panel of Flemish tapestry, woven with a knight and attendant figures kneeling before an altar. 8′ 6″ high, 12′ wide (2.59 x 3.66 m). 102 x 144 inches (259.1 x 365.8 cm). Lot 171. Two persian rugs. Lot 173-178. Twenty-one frames, gilt and carved with foliage, plus five ebonised and one tortoiseshell frames.